For one of our clients we developed a dashboard. The dashboard has a limited dataload, yet the performance is less then we expected. Tabs are taking several minutes to load, and filterings need more time to load as well. I would like to know what the cause is of this lack of performance. Hope you can help me investigating this issue. Thanks for sending the file for investigation. It turned out that several fields with large number of values were classified as Category data type, and shown on the sidebar (although collapsed), when not in use. 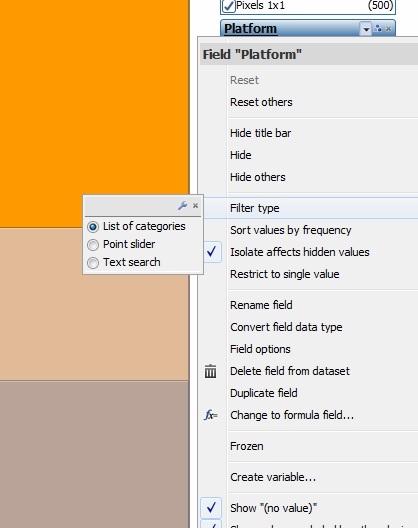 Recommended steps were to convert the data type for these fields to Text, where possible, and also to change the filter type to Text search (see image). Although these filter devices were collapsed, with these settings Omniscope will still need to create numerous tick boxes behind the scenes, affecting the performance for large files.